One gram of black powder is made into an explosive charge. 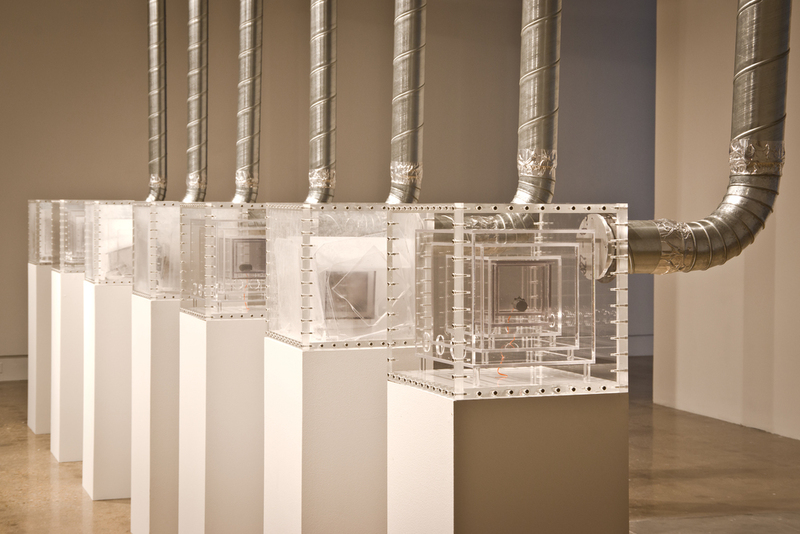 This explosive charge is placed inside the innermost of six nestled plexiglass boxes. Seven identical boxes are placed inside the gallery. At random times the charges are exploded. We read about and watch explosions on the computer every day. In the average American home we are removed from the physical presence of explosions. The first goal of this piece is to bring the explosion as close to viewer as possible. This piece also speaks to the idea of creativity and human control. We manipulate objects to contain our ideas and then call them art. We have a goal that these objects remain static and viewers will come to these objects and retrieve our ideas. To support this goal art objects are made to be archival and museums are made to contain and protect the art object. This goal is an impossibility and runs contrary to life and the workings of the universe. Nothing is truly static. A static universe is a dead universe. This piece embraces the idea that life and art are about change. Without destruction there is no life.